There's one new keyword in War of the Spark, and it's on the side of evil: amass. Remember Bolas's little operation on Amonkhet? It was all designed to create an army of undead elite the likes of which Ravnica had never seen before. Known as the Dreadhorde, this army is now amassing on the streets of our fair city. Uh-oh. Amass empowers you to creature your own Zombie horde. Here's how it works. When instructed to amass, ask yourself one simple question: does annihilating this world spark joy? Then, another question: do you control an Army? 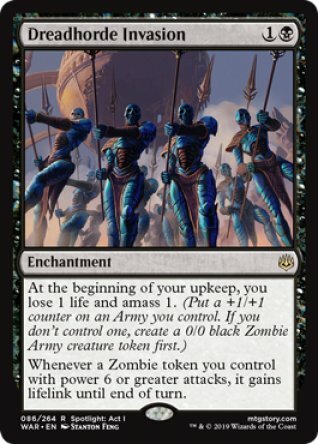 If you don't already control an Army creature, you create a 0/0 black Zombie Army creature token. Then put a number of +1/+1 counters on one of your Armies equal to the number after amass. So, on an empty battlefield, Relentless Advance will give you a 3/3. The Dreadhorde invasion we started continues with Dreadhorde Invasion. If you do control an Army, you don't create any new tokens. Rather, you'll put those +1/+1 counters on an Army you control. If that 3/3 (technically, that 0/0 with three +1/+1 counters on it) is still around, Dreadhorde Invasion's triggered ability will add one +1/+1 counter, and your horde has grown to 4/4. Amass was designed so you'd control one Army at most at any given time. But there are several ways around that. You could copy an Army you control, or maybe you control a creature with all creature types. If you happen to control more than one Army when you amass, you choose one of them to get all the +1/+1 counters. Although players can respond to the spell or ability that instructs you to amass, once you start to amass, no one can interrupt you. This is true even if you're creating a new Army—no player can do anything while the Zombie Army creature token is still 0/0, before it gets the counters. 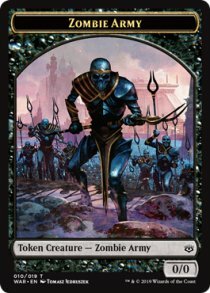 Even though the +1/+1 counters represent the growing numbers of Eternals joining your ranks, the Zombie Army creature token is still a single creature. It has two creature types: Zombie and Army. There are some great bonuses for Zombie tokens lurking in this set, including on Dreadhorde Invasion. Remember, they work with any Zombie token, not just ones created by amass.